What is a Sheimos Bank used for? Halacha forbids us from destroying any item that has kedusha associated with it. These items fall into various catagories – first, those that have intrinsic kedusha, which includes anything from mezuzos and tefillin, and printed seforim such as siddurim, chumashim and gemoros. 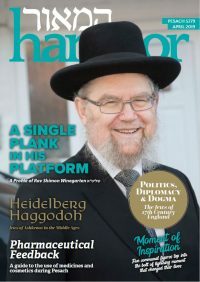 This would also include any printed papers (newspapers, magazines, Parsha sheets) that include the name of Hashem in full. 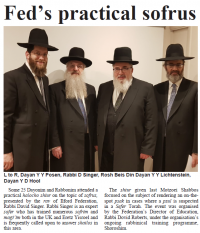 Sifrei Torah constitute a catagory of their own and need to be treated with extra kedusha and as such should not be placed in the Sheimos Bank. See table below for further details. Which names of Hashem need real Geniza? 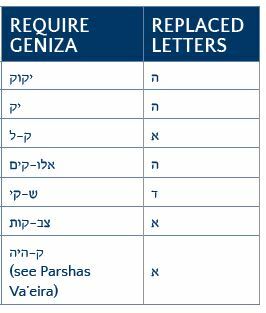 The seven names of Hashem recorded in the table below may not be erased and geniza (burial) is required when disposing of them (please note names have been changed here from the way in which one would find them in a chumash or siddur. In each word a letter has been replaced with a ק. When Hashem’s names as listed have been transliterated they require geniza. When in direct reference to Hashem, terms describing Hashem’s middos such as ‘rachum‘ are used, they require geniza. This needs to be judged contextually. Which names can be discarded? How do I place items in the bank? Items that are placed in the Sheimos Bank should be put into bags before inserting into the slot. 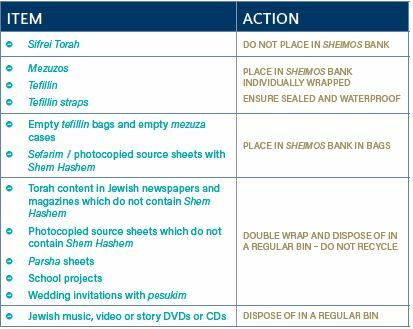 Please note that mezuzos and tefillin should be individually wrapped before inserting and care should be taken to ensure that the wrapping is waterproof. What is a Sheimos Bank not to be used for? If my item should not go into geniza how do I dispose of it? It should be double-wrapped before disposing as normal with other waste. Broken tzitzis strings would also fall into this category. (see table for further details). Can I use my recycling bin? The Federation Beis Din takes the position that recycling should be avoided. The recycling process often sends paper to factories which produce tissue paper rolls and thus is considered to be a direct bizayon. Who should I contact if I have questions or if I’m not sure? If you have a question as to whether your item is Sheimos or not, you can contact the Federation’s ShailaText service by sending a message to 07860 017 641 for a response within four working hours. The Federation’s Sheimos L’Geniza service is offered to the entire community free of charge. However we appreciate donations that help to defray the cost of transporting the Sheimos items for burial.